A podcast launched in fall 2015 by two Bassett Unified teachers on special assignment (TOSAs) celebrated its 100th podcast this month and notched its 70,000th download by educators who are keen to learn ways to integrate technology into their instructional plans. 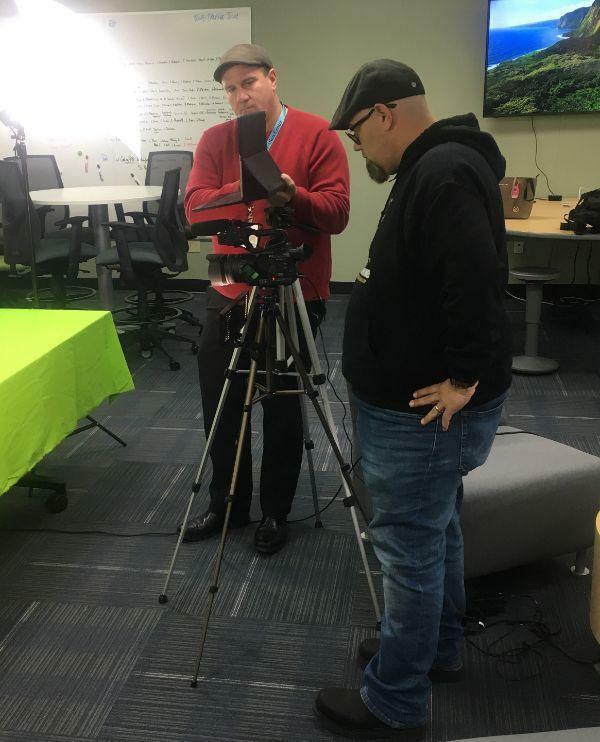 Called “TOSAs Talking Tech,” the podcast was created by Tom Covington and Michael Jephcott as a way to connect with District educators with busy schedules. Podcasts typically run about 20 minutes, designed for listening during commutes or other breaks. The show started slowly, hitting its 15th episode in its second year, but has since grown to a weekly event. Its popularity skyrocketed after the duo presented at Computer-Using Educators (CUE) conferences in 2017, including a two-hour podcasting demonstration at the National CUE Conference. They are now regulars at conferences, appearing almost monthly. This year, Bassett Unified provided tech tools to every student in third, sixth and 10th grade as part of a multi-year rollout of a 1:1 student-to-device program. Covington and Jephcott supported teachers with podcasts as well as intensive in-person training and classroom visits. They said they originally turned to the podcast to expand their reach to teachers. “The main purpose of the podcast was to reach teachers for training through another avenue that could better fit their schedule,” Jephcott said. Along the way, the podcast became a way for them to learn, too. A recent podcast celebrated innovative ways of using 3-D printers in science, technology, engineering, art and math (STEAM) activities. The duo also hosts the teachers they train, showcasing how changes in instruction are playing out. The two teachers celebrated the 100th podcast with highlights from past shows, a reflection on how far the District has progressed since they first launched and what’s to come in future broadcasts. “Our training efforts wouldn’t be where they’re at and our professional growth wouldn’t be anything like it is without the influencers and inspirational people we’ve met through the podcast,” Covington said. He said that the podcast has far more to address in the years to come. Covington said one of the program’s rewards is seeing Bassett Unified’s classrooms become more engaging.